U.S. Gulf of Mexico Map. Photo: Equinor. THE HAGUE — Shell Offshore Inc., a subsidiary of Royal Dutch Shell plc, has announced a significant discovery at the Blacktip prospect in the deepwater U.S. Gulf of Mexico. Evaluation is ongoing and appraisal planning is underway to further delineate the discovery and define development options. “Blacktip is Shell’s second material discovery in the Perdido Corridor and is part of a continuing exploration strategy to add competitive deep water options to extend our heartlands,” said Andy Brown, upstream director for Royal Dutch Shell. Blacktip is a Wilcox discovery in the Perdido thrust belt and was discovered in the Alaminos Canyon Block 380, approximately 30 mi from the Perdido platform and Whale discovery. The find presents the opportunity to augment existing production in the Perdido area where Shell’s Great White, Silvertip and Tobago fields are already producing. Drilling at the initial Blacktip well is still underway and has to date encountered more than 400 ft net oil pay with good reservoir and fluid characteristics. The well is currently being deepened to further assess the structure’s potential. Blacktip is operated by Shell (52.375%) and co-owned by Chevron U.S.A. Inc. (20%), Equinor Gulf of Mexico LLC (19.125%), and Repsol E&P USA Inc. (8.5%). “We are very pleased with this discovery which confirms the potential in the deepwater Gulf of Mexico and underpins Equinor’s strategy to exploit prolific basins and deepen in core areas,” says Bjørn Inge Braathen, senior V.P. for exploration in North America. This discovery in a Shell heartland adds to the company’s Paleogene exploration success in the Perdido area. Through exploration, Shell has added more than 1 Bboe in the last decade in the Gulf of Mexico. The company’s global deep-water production is on track to exceed 900,000 boed by 2020, from already discovered, established areas. 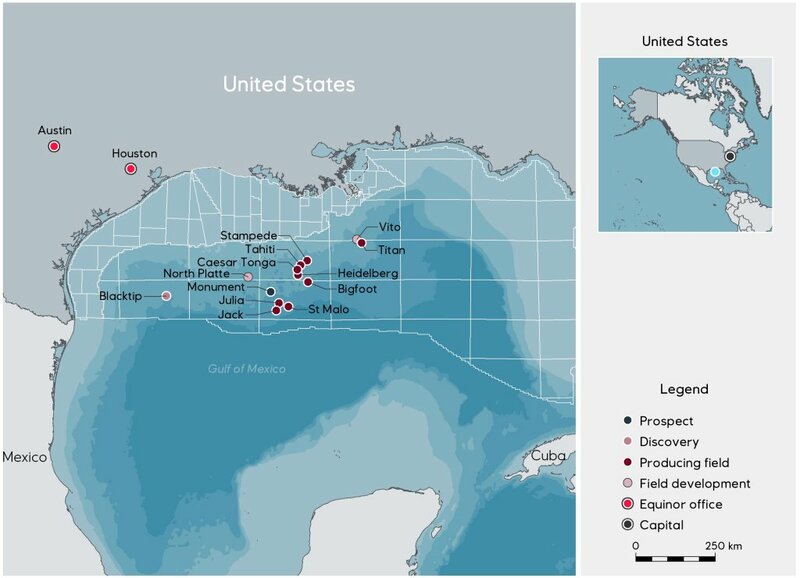 Equinor has been present in the U.S. Gulf of Mexico since 2004 with exploration prospects and interests in eight producing fields in the U.S. Gulf of Mexico and two in development. Equinor is the owner and operator of the Titan facility. Equinor is planning to drill the Monument Paleogene prospect in the US Gulf of Mexico in 2019. In addition to its offshore portfolio in the US Gulf of Mexico, Equinor has extensive U.S. onshore operations in the Eagle Ford (Texas), the Bakken (North Dakota) and the Appalachian basin (Ohio and Pennsylvania). Equinor has approximately 1,000 employees in the U.S. with main offices in Houston (TX), Austin (TX) and Stamford (CT). Photo: Vicky Hollub, president and CEO, Oxy. NEW YORK and HOUSTON (Bloomberg) — Occidental Petroleum is starting a bidding war for Anadarko Petroleum, making a $38 billion counteroffer in attempt to break up the proposed takeover by Chevron. Occidental said Wednesday it’s offering $76/share in cash and stock, a premium of about 20% over Chevron’s April 12 agreement to buy The Woodlands, Texas-based Anadarko. That compares with the $33 billion deal, or about $65/share, agreement that Chevron announced two weeks ago. 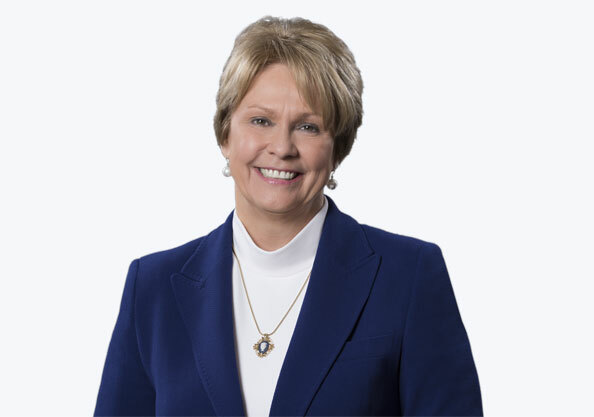 In a letter to Anadarko’s board of directors, Occidental CEO Vicki Hollub said her company has made three bids since late March. Occidental said it has completed its due diligence on the deal and has financing lined up with Bank of America Merrill Lynch and Citigroup. Andarko’s assets include operations in the Permian basin in West Texas and New Mexico. The world’s fast-growing oil major patch, the Permian has helped to turn the U.S. into a net exporter and become a bigger producer that Saudi Arabia. Chevron earlier this year unveiled ambitious growth plans for the basin. The deal was meant to boost Chevron into the upper leagues of oil companies, with output and sales approaching or beating Exxon Mobil’s. Anadarko’s shares jumped as much as 18% to $70.15 in pre-market trading in New York while Occidental plunged as much as 8.1%. Occidental’s offer approaches its market capitalization, which is $46.6 billion. Representatives for Chevron and Anadarko didn’t immediately respond to requests for comment. The latest offer may not be as appealing as Chevron’s to Anadarko shareholders despite the higher price. Occidental’s smaller size and balance sheet to Chevron mean there may be more uncertainty over its prospects of completing a deal. And it’s not immediately obvious how Occidental would fund Anadarko’s giant liquefied natural gas plant that’s being developed in Mozambique. The project may have to be sold, adding another layer of uncertainty. 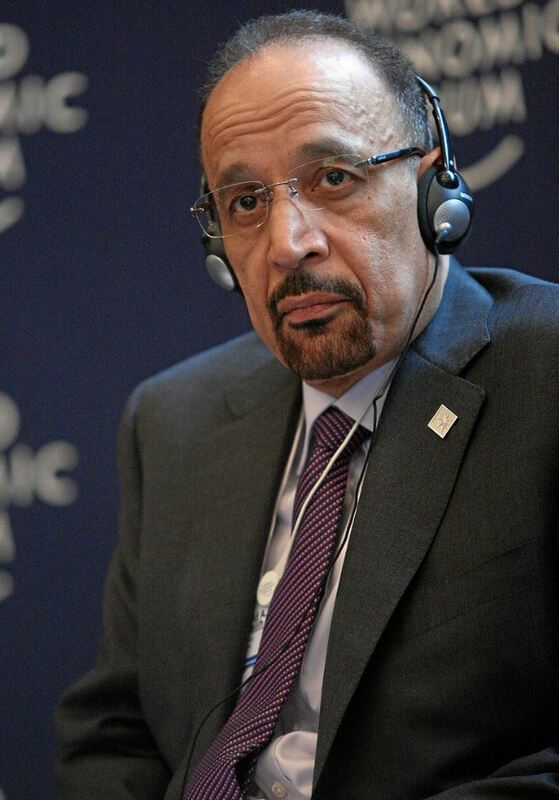 Saudi Energy Minister Khalid Al-Falih. Photo: Saudi Aramco. DUBAI (Bloomberg) — Saudi Arabia’s energy minister said the world’s biggest oil exporter sees no need to take immediate action in the crude market, signaling a cautious response to the U.S. decision to tighten sanctions on Iran. The kingdom won’t significantly raise output in May and will stay within its OPEC production limit until the group’s current supply deal expires in June, Khalid Al-Falih said Wednesday in Riyadh. That would allow for a modest increase in production because Saudi Arabia currently pumps about 500,000 bpd below its quota. Riyadh is treading a fine line between keeping its key U.S. ally happy while preserving unity in the producer coalition known as OPEC+. The U.S. on Monday said it will stop issuing waivers from sanctions for countries that buy oil from Iran. To prevent a possible spike in crude prices, Washington expects Saudi Arabia and other members of OPEC to help make up for anticipated losses in Iranian exports. At the same time, Saudi Arabia is leading OPEC and allied producers in cutting supplies to try to buttress crude and avert a glut. If the kingdom boosts production sharply to offset missing Iranian barrels, it will have a hard time persuading others to limit output. OPEC, including Iran, plans to meet in June to decide whether to extend production curbs into the second half of the year. “We allocated May, and the program is set―the ships are scheduled―so I think there will be very little variation in May production from the last couple of months,” Al-Falih said. Any nation continuing to buy Iranian oil will face U.S. sanctions, Secretary of State Michael Pompeo said Monday after announcing that temporary waivers granted to some countries late last year won’t be renewed. The current set of waivers―issued to China, Greece, India, Italy, Japan, South Korea, Taiwan and Turkey―are to expire on May 2. The U.S. announcement marked a reversal from last November, when Washington blindsided Saudi Arabia by granting the waivers as it sought to damp fuel prices ahead of mid-term Congressional elections. This week’s decision is aimed at reducing Iran’s oil exports to zero, in an effort to pressure the country over its regional policies and nuclear program. Iranian President Hassan Rouhani said it will be “impossible” for the U.S. to completely stop his nation from selling oil. Iran would consider negotiations to resolve the issue, though away from pressure and in a context of “mutual respect,” he said at a cabinet meeting, according to the state-run Mehr news agency. “First, we need to make the U.S. regretful, and have no choice but to resist,” Rouhani said. Pompeo has said he’s confident the market will remain stable as Saudi Arabia and the United Arab Emirates — Iran’s top regional foes — will help ensure an appropriate supply of oil. Saudi Arabia and the UAE can increase their combined production by about 1.5 MMbpd within a short period, according to people with knowledge of the matter. The additional oil would more than compensate for losses from Iran, which shipped about 1.1 MMbpd in the first half of April, data compiled by Bloomberg show.